In 1978, a group of lecturers led by Tomas Lang began to teach computer architecture at the Barcelona School of Informatics (FIB) and to carry out research. Several years later, this team would become the core staff of the Department of Computer Architecture. Initially, the lecturers were based in the UPC’s Plàtan building at Torre Girona. In the summer of 1985, they moved to the FIB’s new headquarters, the U building on the UPC’s South Campus. The Department of Computer Architecture (DAC) in its current form was created in 1987 through the application of the University Reform Act (LRU) and the 1985 UPC statutes. The Department was not based exclusively at one school, as it was made up of lecturers who had taught at the FIB and others who taught computer architecture at the School of Telecommunications Engineering of Barcelona (ETSETB). In the 1990-1991 academic year, it moved to the UPC’s North Campus. It was initially located in modules D3 and D4. Subsequently, in the summer of 1992, it left module D3 to occupy the whole of module D6. In 1997, it left module D4 to partially occupy module C6. Finally, it went on to occupy practically the whole of module C6 in 2004. In the 1991-1992 academic year, the DAC began teaching at the Technical College of the Baix Llobregat (EUPBL), in Sant Just Desvern. In October 1991, the European Parallelism Center of Barcelona (CEPBA) was set up, bringing together the DAC’s experience in parallel computing and the supercomputing needs of other UPC departments and the industry. DAC lecturer Mateo Valero was the promoter and first director of CEPBA; in 1995, he was succedded by DAC lecturer Jesús Labarta. In 1993, the DAC was awarded the University-Enterprise Foundation Prize, which is given to the university department with the best research projects in Europe. 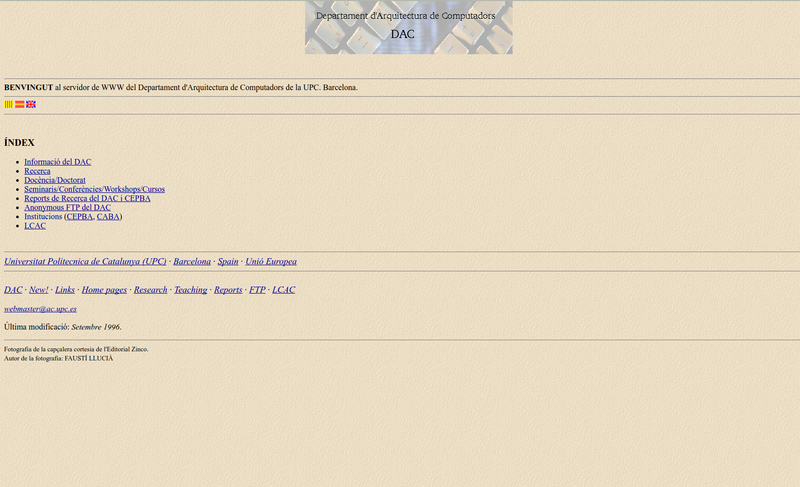 In the 1993-1994 academic year, the DAC began teaching at the School of Engineering of Vilanova i la Geltrú (EPSEVG). 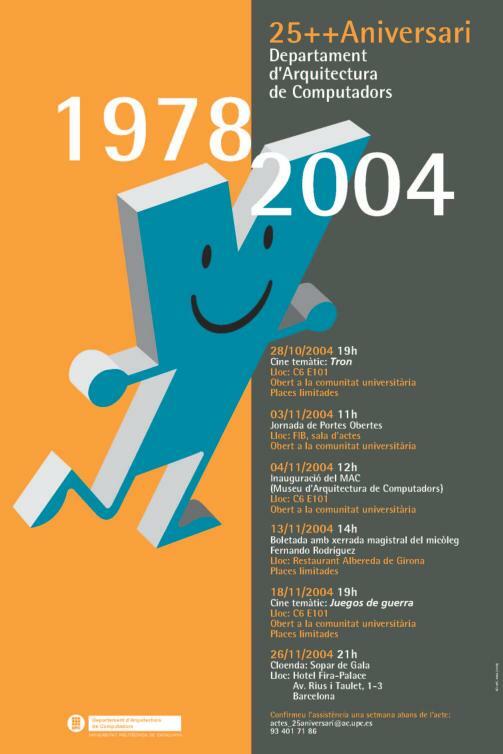 In 1995, DAC lecturer Mateo Valero become the director of the "Centre de Computació i Comunicacions de Catalunya" (C4). C4 was created by the Catalan government to coordinate the activities of CEPBA and CESCA (Supercomputing Center of Catalonia). In 1996, the DAC received the Gold Medal from the Nikola Tesla Foundation (University of Belgrade) for its work in the field of computer science. 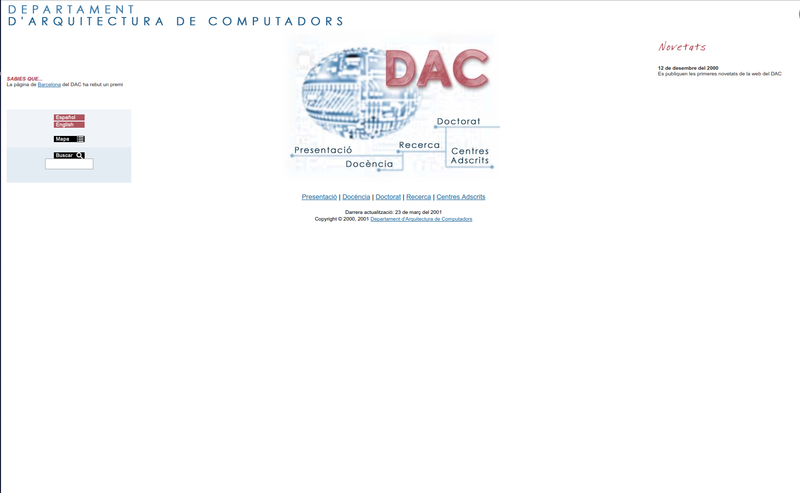 In 1996 DAC's webpage was created, which was renewed in 2001 and in 2009. In 1998, the DAC became the first department at the UPC to hold an annual series of seminars, the JoDoDAC. In 2000, the DAC lecturers Roger Espasa and Toni Juan were appointed as directors of the Barcelona Systems and Servers Advanced Development (BSSAD) research center, which was set up by the company Compaq for the purpose of researching future generations of microprocessors. In October 2000, the DAC lecturer Mateo Valero prometed and become the director of CEPBA-IBM Research Institute (CIRI), the first center that IBM settled in an european university. CIRI collaborated in IBM key projects like Blue Gene, which at one stage was the most powerful supercomputer in the world. In the 2001-2002 academic year, the EUPBL moved to the Baix Llobregat Campus in Castelldefels and became the Castelldefels School of Technology (EPSC). The DAC took charge of teaching the Diploma in Telecommunications Systems, the Diploma in Telematics and the Degree in Telecommunications Engineering at the EPSC. In the 2002-2003 academic year, it began teaching the Diploma in Air Navigation Systems. In 2002, the DAC lecturers Roger Espasa, Antonio González and Toni Juan became the directors of Intel Labs Barcelona. The aim of this center, which replaced the BSSAD, is to carry out research and development on microprocessors. In 2004, a series of events were held to commemorate the DAC’s 25th anniversary with. To mark the occasion, a comic strip was published that recounted some of the milestones in the history of the DAC. The Museum of Computer Architecture (MAC) was also opened. In 2005, a number of DAC lecturers played a decisive role in creating and setting up the Barcelona Supercomputing Center (BSC-CNS). One of the DAC’s lecturers, Mateo Valero, was appointed as its director. The Center’s facilities house the Marenostrum supercomputer, which at one stage was the most powerful in Europe and the fifth most powerful in the world. In 2008, DAC lecturer Mateo Valero become the scientific director of BSC-Microsoft Research Centre. The Centre focusses on the design and interaction of future microprocessors and software for the mobile and desktop market segments. Over the years, individuals from the DAC have directed the Department, have received awards and honors and have been involved in the creation of spin-offs.